Taking tough stand on the encroachment on forest land in the state, the High Court of Himachal Pradesh has made clear that no organization or Body, including political party would obstruct the implementation of the court orders. 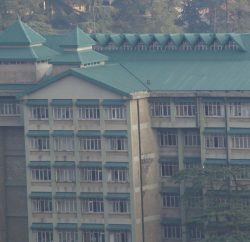 The Court of Justice Rajiv Sharma ruled that while conducting the eviction proceedings, there shall not be any political interference, and asked Divisional Forest Officers and the Revenue Courts to bring into the notice of the Court if any political interference is attempted while conducting the eviction proceedings. The Court ordered that “Any attempt even by an individual, political party, officers/officials towards the implementation of the judgment/order shall amount to contempt and would be dealt with accordingly”. The Court further directed to vediograph the eviction proceedings and produce in a sealed cover before the Registrar General of the Court for its production before the Court. The Hon’ble court also directed not to stage any kind of “Dharnas” during the eviction proceedings. “It shall be open to the official machinery to invoke the provisions of The Code of Criminal Procedure while executing the orders of this Court, including imposition of Section 144 of The Code of Criminal Procedure,” the court ruled. The Court direct Director General of Police to ensure the deployment of sufficient number of police to ensure the implementation of the orders, if necessary by requisitioning the police force from Himachal Pradesh Armed Police Battalion, the court further ruled. 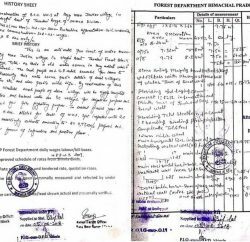 The Additional Chief Secretary (Forests), Government of Himachal Pradesh would be personally liable to implement this order, the Court ruled. The court also directed the Additional Chief Secretary (Forests), Additional Chief Secretary (Revenue) and Principal Chief Conservator of Forests to complete the demarcation process within a period of three months and put up the challans in Criminal Courts, failing which, contempt proceedings are liable to be drawn and, if necessary, may be put under suspension for not implementing the orders of the Court, worthy Justice ruled. The Court also cautioned the State Government not to bring any policy for regularization of encroachment. The State Government has no authority to frame a Scheme to regularize the encroachment made on the forest land as per the Forest Conservation Act, 1980, the Court ruled. Taking tough stand on the big sharks, who have encroached the large chunks of land, the court directed to evict them forthwith and, if necessary, constitute a Special Task Force.